With Spring Break a week away (eek, I cannot wait!) my packing has begun in earnest. The hardest thing to decide on is which skincare and makeup to bring. 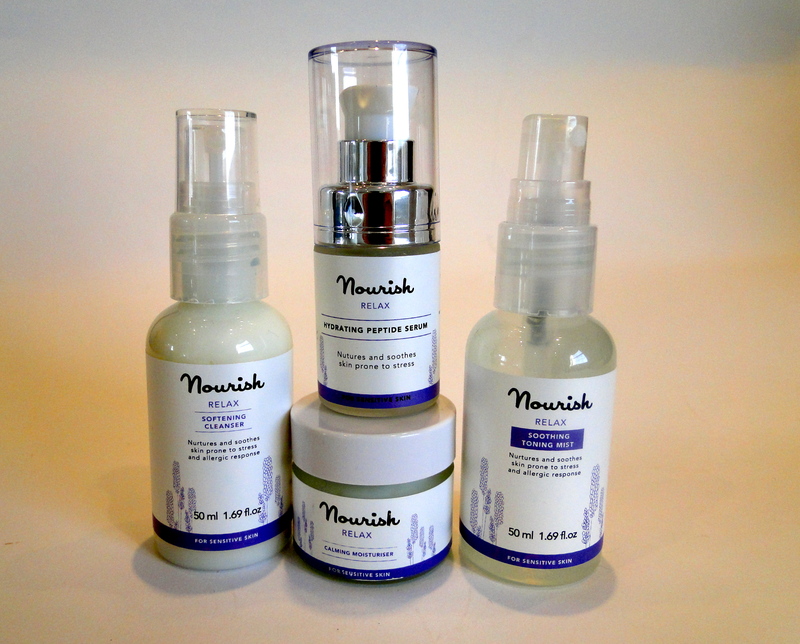 Nourish Skincare has made this choice a whole lot easier with their Relax Mini Kit. Consisting of a cleanser, toning mist, moisturizer and serum all smelling wonderfully of lavender, the kit is a great way of sampling the company as well as simplifying the travelling process (all the bottles are regulation size). The scent is super relaxing, and just what I need coming off a long-haul flight. The cleanser comes in a handy pump bottle and is a light cream cleanser. Because it doesn’t foam or exfoliate there is no risk of irritation for my sensitive skin. It does a really good job of removing my makeup – after cleansing, all foundation and bronzer is gone, but I don’t feel tight or dry. The cream smells quite strongly of lavender, which I love, and it’s a lovely way to get all relaxed before bed! The toning mist is a lighter way to use a toner, and the spritz bottle is wonderfully refreshing. Like the cleanser, the toning mist has no sort of drying effect. It smells divine – again pure lavender, and it sinks super fast. The serum continues the set, it is a light serum which is cooling when applied. One pump is enough per application, and I would say this had the softest of scents from the kit. Once rubbed in, my skin felt smooth and soft. To finish the kit is the calming moisturizer. A rich, thick cream in a cute little glass a little smear is all you need. The cream sinks in really fast considering the consistency, and creates a smooth canvas for makeup application. All the products are made with organic ingredients, and the scents are really relaxing – just what you need on your holidays!